Complete EML Converter Suite to Convert EML to PST, Office365, MBOX, NSF, EMLX, MSG and HTML files. Best EML Converter Suite helps to multiple EML Convert into Outlook PST, Office365, MBOX, NSF (Lotus Notes), EMLX, MSG (Outlook Individual Mail Messages) and HTML file. 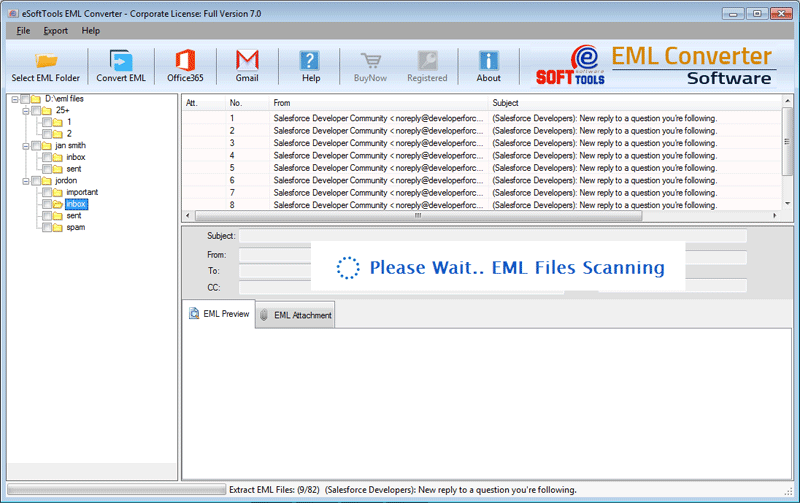 This suite has more than capability to scan unlimited EML files in seconds and load it for quick conversion. 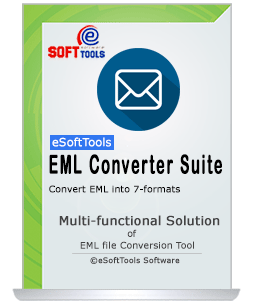 Free to try EML Converter Software Suite and easy to test over multiple EML file to PST and other formats. Demo version: The trail version of EML Converter suite tool allowed to convert 25 EML files to PST, Office365, NSF, MBOX, EMLX, HTML and MSG file. 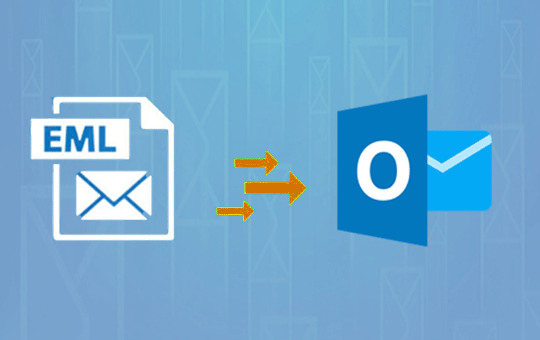 Best tool for EML to PST Outlook Conversion! 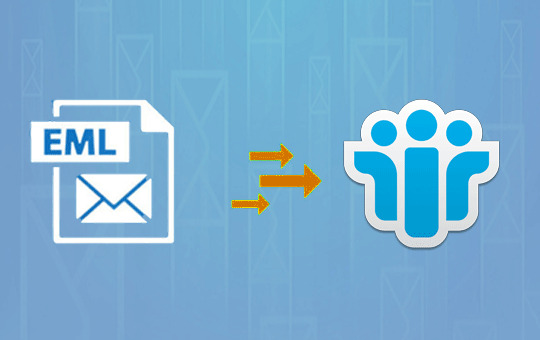 This software has more flexibility to handle unlimited EML file to PST conversion with maintained folder-structure. EML Converter Software Suite is very time saving utility that help to import EML to Office365 cloude in single mouse click and save time. Bulk EML to Office365 migration is much simple task and also maintain read EML folder structure. MBOX file used by various email client like, Thunderbird, eMClient, Mailbird, Sea-monkey and many others. 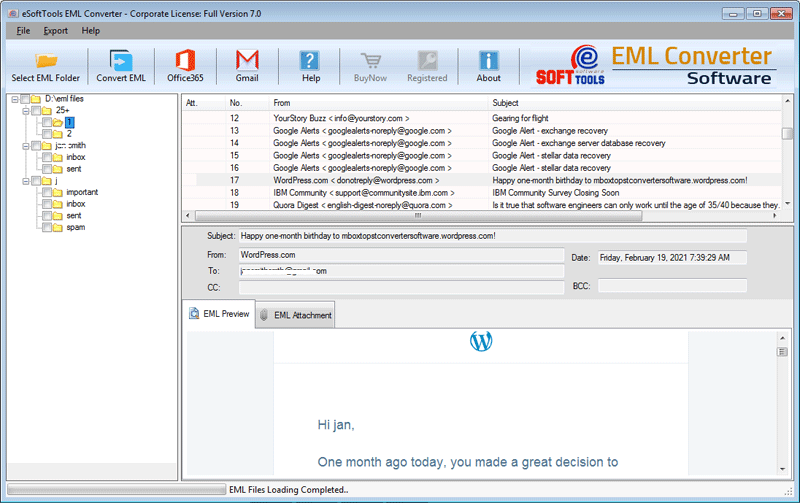 EML Converter suite easy to manage eml messages and built-up new .mbox file with all attachments and embedded data. Need to migrate EML file to Louts Notes? then eSoftTools EML Converter Suite is best choice which provide flexibility to easily migrate EML to NSF files. The new NSF file is supported by latest version of IBM Lotus Notes. Best EML to MSG Conversion tool always maintains EML messages original structure and eml data (attachments and embedded data). Bulk EML to MSG Conversion is also possible with quick steps and fewer mouse clicks with preview of EML messages. Migrate Windows EML files into MAC OSX Apple Mail (EMLX) without missing data by using eSoftTools EML Converter suite tool. Everything is successfully migrate from EML to EMLX file and with attachments. Free to try Demo Version: The demo version software allows to convert 25 eml messaages to every format including Outlook PST, Office365, MBOX, NSF, EMLX, MSG, HTML file. How do i use EML Converter Suite? Install the softwaer and open it. Once loading completed, go with real EML file conversion by clicking on "Convert" button from toolbar. On the export wizard, choose the required conversion format and proceed to export eml file. Graphical working of EML Converter software : How EML Converter Tool Works.. I want to export EML file to Office365 and MBOX. Is this format available? Yes! EML Converter Suite has multiple conversion option including convert EML to Office365 and MBOX file. I am Thunderbird user and i have more than 10K EML files in my external hard-drive! How can i view these EML files in thunderbird. 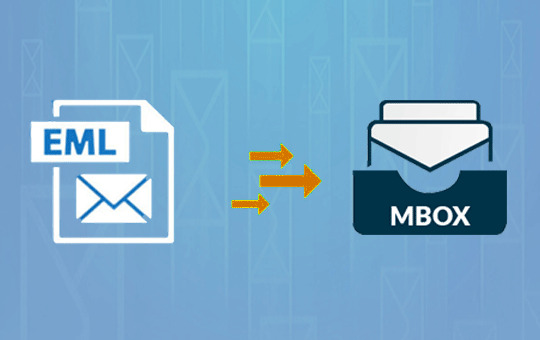 Thunderbird email client stores all the messaging data in single file called ".mbox" file. I recommend you to convert eml file to mbox by eSoftTools EML Converter suite and create .mbox file against your all 10K eml files and after that you can easy to import .mbox file into your thunderbird. What is the difference between DEMO/ Trail and Full Version? The demo/ trail pack has limitation in conversion counting! The demo/ trail version allowed to convert only 25 eml files to any other format. And the Full version provide flexibility to convert unlimited eml file to pst, office365, mbox, emlx, html, nsf, msg file. How to Use EML Converter Suite & Convert EML Files? Know more in detailed stepes about EML Converter Suite working and conversion into Outlook PST, Office365, NSF, MBOX, EMLX, MSG and HTML file. It is a really amazing tool! It can export data from EML file format to many different formats including PST, NSF, Office 365 etc while maintaining the accuracy of the information. I would like to recommend it to all my friends due to its performance and feasibility. After research of many hours, I concluded that eSoftTools EML Converter Suite Tool is the suitable choice. It allowed me to convert my EML file into PST and many other file formats like EMLX, HTML, PST, MSG, and others. It took a few seconds for EML file conversion. Thank you eSoftTools and keep the good work up! eSoftTools EML Converter Suite Tool helped me to export EML data into several different file formats like PST, EMLX, HTML, NSF, and others. The best part which I really liked about this tool is that the information is not altered in any manner after conversion. My friend suggested eSoftTools EML Converter Suite Tool for EML file conversion as the best and yes he was right. This tool is easy to operate with a brilliant performance. It can convert EML file into many different file types from any condition. Even EML to Office 365 conversion is also possible.